A hidden water pipe leak could result in a messy situation for your home and your monthly expenses. Do you know that a leaking pipe can cause thousands of dollars in property damage if not properly handled? When your water bills become suspiciously higher than normal, you will need to investigate to see if there is a leakage going on. It is essential that the water pipe leak be solved as soon as possible to prevent further damages. 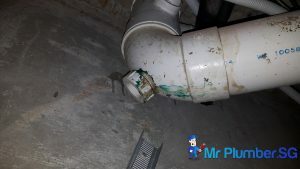 If you live in a Condo or HDB, you may think that a pipe leakage is the responsibility of the condo management or the HDB’s, but in actuality, the responsibility lies with the home owner. Most water pipe leaks remain undetected until the leakage affects the surroundings, leading to damages. In the event that the leakage spreads towards electrical installations and lighting, it may develop into an electrical hazard. So, it is important to weed out this issue as soon as it is discovered to prevent further damages from happening. 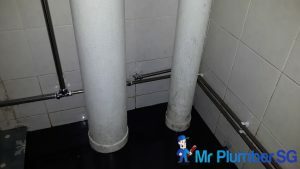 At Mr Plumber Singapore Plumbing Services, we provide water pipe repairs and re-piping services in Singapore using the latest equipment and experienced plumbing contractors. 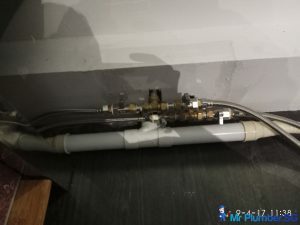 We can handle and repair all sorts of water pipe leak issues, including Exposed or Concealed Copper Pipe, Stainless Steel Pipe, PPR pipe, PVC pipe, UPVC pipe, sink pipe, etc. We also provide similar re-piping services for homes and commercial properties. 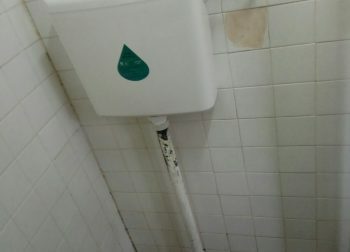 On top of that, we also handle other leakages issues such as water heater leakage or toilet bowl leakages. 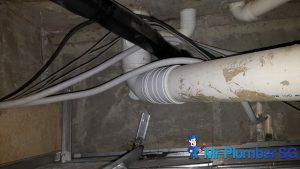 How do you know you have a water pipe leak? 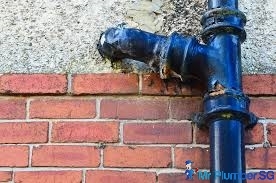 Majority of water pipe leaks unfortunately occur in spots that are hard to find or see. 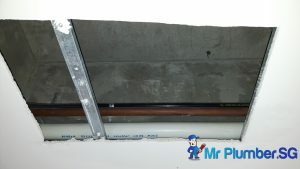 There are concealed pipe leaks that will cause the slabs to have leakages coming out. There are also pipe leaks caused by tree roots underground which could lead to a huge wastage of water and flooding around the area. 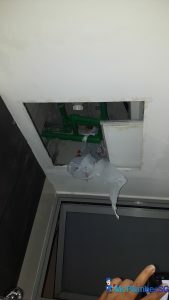 How do we go about finding such hidden leakages? 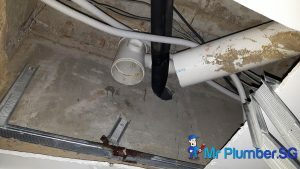 If there’s concealed pipes behind the walls and you can hear drippings or even rushing of water, it is likely a sign that there may be a leakage occurring. When you receive your utility bill, seeing a huge increase in water consumption will likely lead you to ask around if there has been an increase of water usage at home. But if there is no one using more water that month, you will have reasons to believe that there may be a leakage going on. Puddles of water occurring overnight can be a cause of alarm. 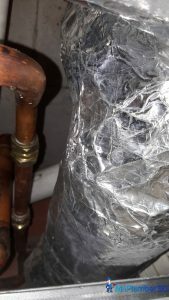 These cases are common to our plumbers that went down for the owner’s plumbing pipe emergency. The pipes are hidden beneath the flooring. It is always due to the pipe leakage that such a puddle can be formed overnight. Signs of mold growth indicates that there is high moisture content. 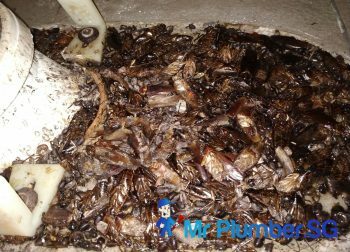 This can be due to a leakage that has provided nutrient for the mold to grow. Water stains are obvious signs of leakages that may be happening around that area. 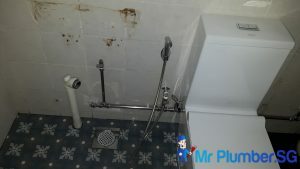 If you have seen any of the above signs of leakage, it is best to look for a professional plumber that can look into the issue and confirm if there’s any hidden leakages going on. 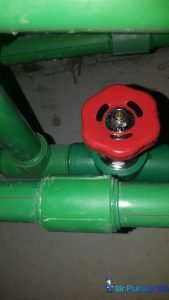 Seals are placed when the pipes or equipment are installed. As time goes by, due to wear and tear, the seal may break off causing the leakage. It is important to look out for signs before the seal breaks off. 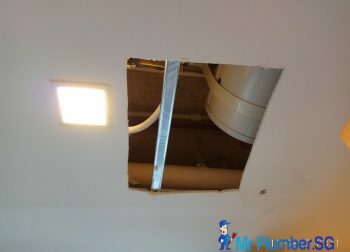 For example, if there are condensation appearing near the seal or even puddle around the seal area, you may be faced with a water leakage situation. Clogs can happen when there are foreign or large object trapped in the piping. Common cases of clogs happen around the drainage pipes and sink pipes. 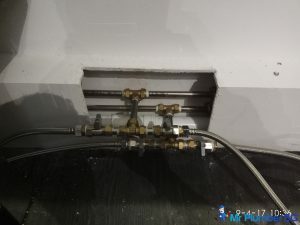 As the supply of water or the passage of water continues, the pressure will begin to mount the area of clog, which can result in an overflow or pipe burst, causing the leakage. The important take away is to never introduce large or foreign objects into these pipes. 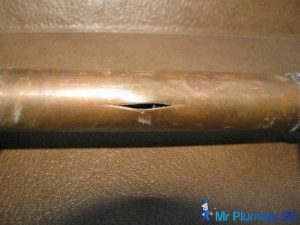 Corrosion can occur within the pipes when the pipes begins to rust or if there are corrosive materials passing through the system. 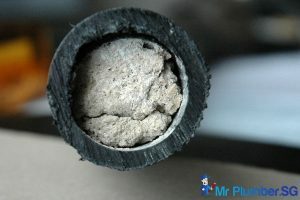 The corrosion will break down the pipe over time and cause a leakage. 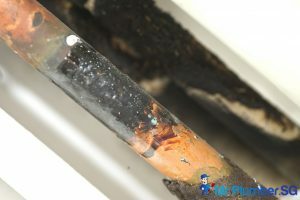 If any discolouration or unusual changes is spotted around the pipes, it can be a clear indication that corrosion has occurred. The pipes are often only as strong as its weakest link. 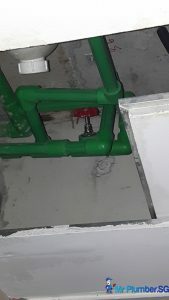 In this case, the weakest link would be around the connecting joints of the pipes. The pressure is the highest when the contents in the pipes, usually waste water, changes direction at the joints. This causes the joints to have a higher wear and tear rate, eventually leading to a leakage. A good indication of a faulty joint would be the noise it makes. If you hear any ticking or banging from the direction of the joints, you may want to look for a reliable plumber to look into you case. Most pipes can only withstand a certain amount of water pressure. 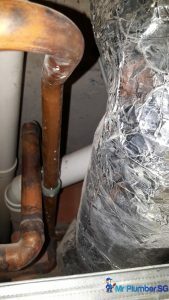 When the water pressure becomes excessive, this may cause unneeded strains upon the water pipes, which will eventually lead to a pipe burst or a water leakage. 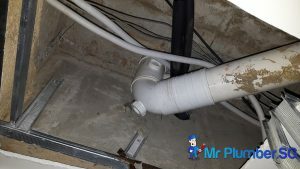 Not all pipes leakage is located within the home. If you live in a landed property, you probably have to take responsibility of the pipes within your yard. 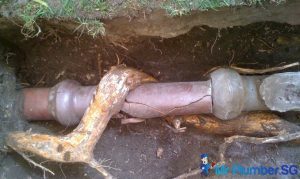 If there’s a tree growing in the yard, there is a possibility in which the roots may intrude on the piping causing a leakage to happen. Although hard to see, these leakages can be detected by wet patches or sink holes within the yard or a sudden drop in your water pressure. Extreme change in temperature can cause the pipes to expand and contract. 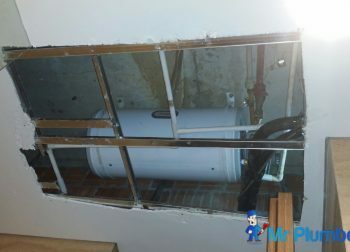 When the temperature is hot, the pipes will expand. And when the temperature is cool, the pipes will contract. 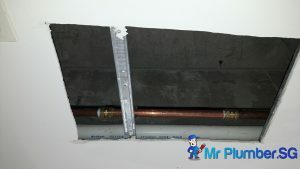 This rapid change in expansion and contraction will result in a crack in the pipe to form, causing a leakage to happen. 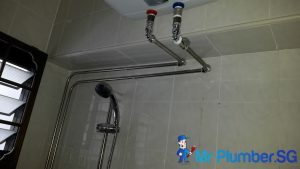 There are many types of pipes in use for plumbing system in Singapore. Here are some examples that you can find in the market. PPR is an acronym for Polypropylene Random copolymer pipe. It is mainly used in hot water pressurized plumbing and mechanical systems for water supply. PPR pipes can be welded together via fusion welding to form a longer piping. 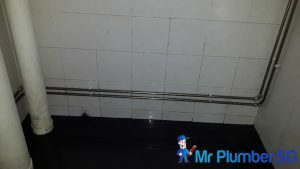 PPR pipes are cost effective and environmental friendly. Stainless steel pipes, as its name implies, are made up of stainless steel. It is mainly used in channel water supply, especially in hot water supply. Stainless steel is most resistant to rust than compared to copper. PVC stands for polyvinyl chloride. PVC pipes are lighter and easy to work with compared to galvanized steel pipes. 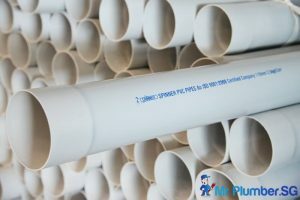 PVC pipes are mostly used for drains or waste pipes, and not as water supply lines. 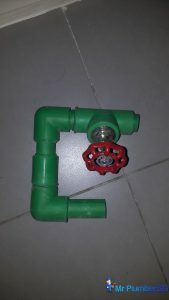 It is commonly seen in HDB flats because it is easy to install and requires relatively little equipment to make into a pipe line. 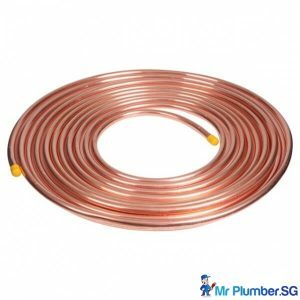 Rigid copper pipes are mostly used as a water supply pipe because it does not have any health hazards than compared to PVC pipes. 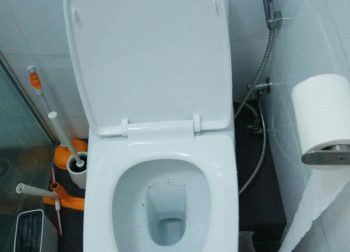 These pipes can be easily cut with a hacksaw. Connecting the pipes however will require experience handling to solder the copper together. PEX stands for cross-linked polyethylene. These pipes are flexible, colour-coded, easy to cut and simple to join. It can even make 90-degree curves easily, making it a popular choice amount home-owners. PEX pipes are mainly used for water supply lines. ABS, also know as acrylonitrile butadiene styrene, these pipes can look very similar to PVC pipes, with the exception that it is black in appearance. 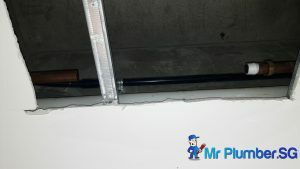 ABS pipes are mostly found in old building and has been since been replaced with PVC piping. 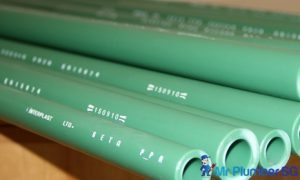 Similar to PVC piping, it is mainly used for drain pipes and vent pipes. 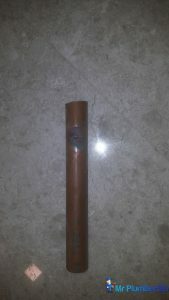 Flexible copper is used for making short runs, that is the final connection between pipes. This can be commonly seen on water heaters, water supply to water coolers or even the washing machine. Flexible copper is easily manipulated for it to be fitted in tight corners and can be cut with ease, with a hacksaw. It is mostly used indoors due to its inability to stand extreme temperatures. Cast iron are usually found within old buildings and is mostly used as sewer lines. Cast iron are extreme durable and can be used until it rusts off completely. 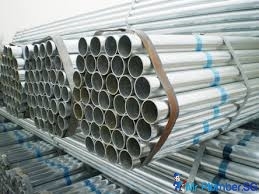 Galvanized steel pipes are made up of galvanized iron forming into a pipe. These pipes are easily identified by each end of the pipes being threaded and its individual pipes are joined together via connecting joints. 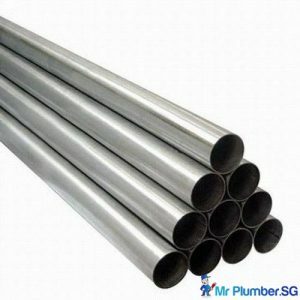 Galvanized steel pipes are rarely used in new construction or by inexperienced plumbers. Galvanized steel can only be applied to other previously installed galvanized steel piping. If you suspect that you have a water pipe leak in your home, call us today. 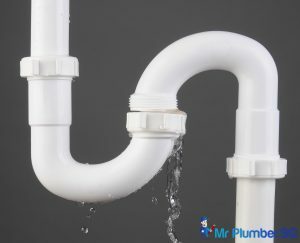 To find out what happens during our professional plumbing services for water pipe leakage repair please visit this page. 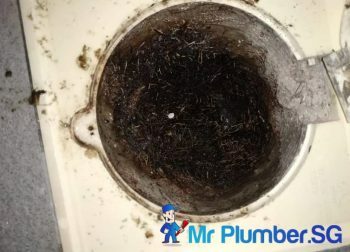 Our team of experienced plumbers will carry out a visual inspection to pinpoint the source of your water leak in an efficient, affordable, and marginally disruptive way. Not only will we find and repair your water pipes, we also guarantee you the highest level of customer support throughout the repair project. Our rates are affordable and transparent, and our experienced plumbers will do their best to provide a lasting solution to your water pipe leak. 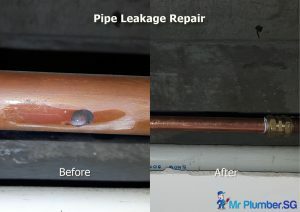 For your pipe leak repair and other plumbing services, call us today at +65 6653 6258 or send an email to [email protected] and a customer representative will get in touch with you as quickly as possible.